So you are looking for a good quality holster for your shiny new blaster? 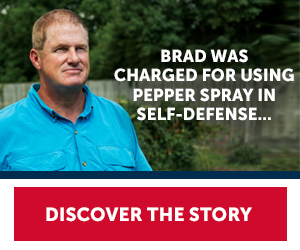 You have come to the right place if you are looking for information about Kydex Holsters. What is kydex and why is it used to make holsters? Kydex is a hard plastic that is a composite of acrylic and polyvinyl-chloride, also known as PVC. PVC is known for its chemical resistance and toughness. Kydex is an extremely versatile plastic that can be formed into virtually any shape, is waterproof, scratch resistant, holds its shape extremely well and will not stretch or shrink under normal environmental conditions. All these properties make it perfect for firearms holsters. Most kydex holsters are molded to fit a particular make and model. This is to ensure a snug fit in order to retain the gun securely, yet make it easy to draw quickly when needed. Click if you want to know more about Kydex on Wikipedia. A kydex 1911 holster typically will fit any standard 1911 with the same barrel length. For example, most commander 1911s will fit into the same holster, with the exception of guns with Picatinny rails or other modifications may require a custom holster. Also, Sig Sauer 1911 models do not fit in a standard 1911 holster, but Blade-Tech does carry a Classic Kydex Holster for this type of gun. The slide on a Sig 1911 tends to be slightly wider and less rounded than a standard 1911 pistol. As with any other product, the quality of any Kydex holster will vary, and a lot of that depends on the thickness of the material. OWB stands for “Outside the Waistband” and IWB, you guessed it, “Inside the Waistband”. OWB holsters are used to carry your firearm on your hip, attached to your gun belt by a clip or straddling your belt with a paddle. 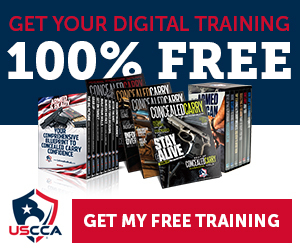 This is hands down the best place to carry your firearm when it comes to the ease and speed necessary to draw your weapon quickly, such as in a deadly force encounter or competition. 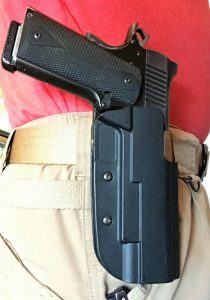 When it comes to concealment, OWB holsters work well if you are wearing a jacket or coat, or depending on your frame, an untucked long sleeved shirt will also work. Most Kydex OWB holsters are made entirely of Kydex, where IWB holsters usually are a combination of kydex and a softer material such as leather, faux leather of other material for comfort. This is because one side of the holster will be pressed against bare skin or with just a T-shirt protecting your skin. This type of holster was first made popular by Crossbreed Holsters, and is now copied by many manufacturers due to its excellent design. IWB holsters are also used to carry your gun on your belt, but inside the waistband. Only the stock (grip) will be visible above the belt line. IWB holsters are designed differently depending on the position you plan to use to carry the weapon. There are IWB holsters designed to be worn on the hip, behind the hip, or in the front (appendix carry). OWB kydex holsters such as the top rated kydex holster brand, Blade Tech, come in different configurations. Blade Tech has ASR, Tek-Lok or paddle attachments. I will explain each one. ASR stands for Adjustable Sting Ray Loop which requires you to thread your gun belt through it. It is adjustable for the width of your belt. This is the most secure and stable of the available attachments. Here is an example of this type of holster on Amazon. It is available for many models of guns. Tek-Lok is their versatile, adjustable lockable mount that can be attached and removed from your belt without removing your belt. This is my personal choice as it is extremely secure, yet convenient to remove. It is also adjustable for the width of your belt. In this short video I show how the Tek-Lok attaches to your belt and how it is adjusted. Paddle type attachments simply slide over your belt with the paddle between your pants and your body. They clip in place so they are fairly secure and easy to remove. This is my least recommended style as they are not as securely attached to you and depending on your frame, can be uncomfortable. IWB Kydex holsters typically clip to your belt using plastic or steel clips. 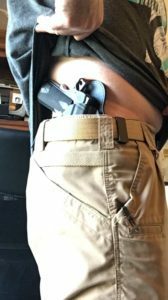 Since the holster is inside your pants and sandwiched between your body and belt, the are almost all quite secure. See the Alien Gear Cloak Tuck Review. Some of the less expensive IWB holsters use only one clip, but I recommend buying a holster with 2 clips, which is more secure and distributes the weight of the gun better. In my experience, when I put it on at the beginning of the day, I forget about it all day long as it never moves or shifts requiring me to adjust it. Which Type of Kydex Holster Should I get? This depends on your intended use. If, for example, you are planning to go to Front Sight Firearms Training Institute for a 4-Day Defensive Handgun course, I highly recommend (as does Front Sight) a Blade Tech Signature OWB holster for your particular gun. You will get the most out of the training with an OWB type holster, although have seen people using IWB holsters at training. If you are open carrying or carrying Concealed where it is appropriate to wear a jacket or heavy shirt, an OWB holster will work fine. If you need better concealment like I do in all weather, an IWB holster will fit the bill. How Much Should I Pay for a Top Rated Kydex Holster? Holsters, like anything else, vary greatly in price. Generally the more you pay, the higher the quality. They range from $25 up to over $100. If you want long lasting quality, I would try to stay in the $69-$99 range. A great place to look at a variety of holsters is Opticsplanet.com. You will see the wide price range. How do you know if you are getting a good deal? Stick with the brand names known for quality like Crossbreed, Galco, Comp-TAC and DeSantis. These companies stand behind their products and having several myself, I can assure you they are excellent quality. I use a Crossbreed SuperTuck leather and kydex holster design specifically for my 1911 every day for close to 10 years and it still works with no sign of any issues. No part is breaking, tearing, loosening or falling apart. When looking for holster, the truth is that you may end up buying one that simply does not work for you. A lot of people (myself included) don’t realize at first how critical it is to get a good holster. This is especially true if you intend to use it all day every day. As a result, we end up with a box full of cheap holsters that either did not fit the gun correctly, were difficult to put on, or were uncomfortable to wear.